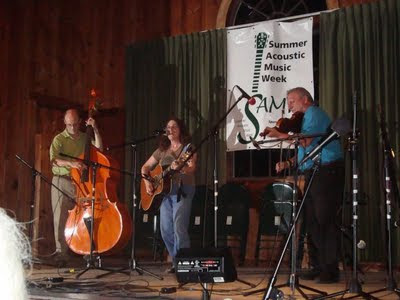 Just recovering from my week at WUMB's Acoustic Music Camp, where I took classes with Brooks Williams, and Siobhan Quinn. This pic, thanks to my new friend, Patti Wilson, fellow camper and great singer, shows me playing my song 'Dancing Tonight' with the amazing all round musician John Kirk and wonderful stand up bass player Rick Woods. It was one of the most fun times I have ever had on stage!!! Please visit the links for more info on the artists and the camp.